Environmental consultants, contractors, geotechnical engineers, and geologists are using geophysical testing methods to increase their understanding of conditions that have historically been unknown. For nearly 10 years, Terracon has offered geophysical and related specialty testing services nationwide. Why is this important to you? With all of the different tests and methods out there, it can be confusing to know what’s best for your project. While not suitable for every project, geophysical testing is less invasive than traditional subsurface exploration methods. With a general working knowledge of geophysical methods, you can make more informed decisions about the options that are available. The first thing to understand is the need for complementary data in geophysical explorations. Geophysical data is a form of remote sensing, and it is only as good as the physical data we have to correlate (e.g., coring, borings, test pits, etc). The performance of geophysical testing early in the exploration allows subsequent intrusive testing to be more surgical, focusing on areas of anomalies instead of across the entire site or at random locations. A trained and experienced geophysicist must begin with an expectation of the subsurface environment, and then apply the proper suite of tools to produce meaningful results. With our team of geophysicists located across the country, we are able to work with you to identify the best geophysical testing methods for your project. 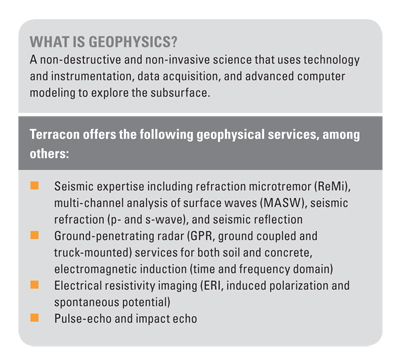 Terracon’s geophysical services integrate and provide advantages to property owners involved with environmental, facilities, geotechnical, or construction materials projects, and more. Geophysical testing can be useful on a variety of environmental projects. For example, does your property potentially have underground storage tanks? Since the late 1980s, the Environmental Protection Agency has regulated underground storage tanks (USTs) from installation to removal. However, many tanks that were installed and possibly removed before those dates may be identified as a potential risk in a Phase I Environmental Site Assessment. Using geophysical methods, the sites can be mapped to determine if buried tanks or even old tank pits exist on the site. What happens when you want to add a new load to a 50-year-old building with no plans? An investigation must be performed to determine the structural elements of the building. From the reinforcing steel size, spacing, and depth in floors and walls to the location of the foundation elements, Terracon’s geophysicists can help. Terracon implemented geophysical testing for the historic Alamo when a section of the century-old roof was nearing failure. 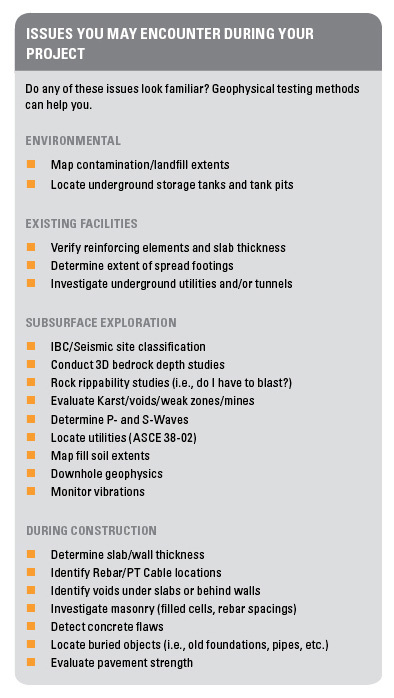 Variability in the depth to bedrock can have a major impact on the cost of a project. Mapping the bedrock surface using borings exclusively can be time-consuming and expensive. Combining geophysical test methods, such as seismic refraction, reflection, or ERI with borings, can provide better coverage of the site with more data for the same or less cost. A contour map of the bedrock surface can be created drawing from geophysical and geotechnical information, allowing a site-wide glimpse into the changes of the bedrock surface, whether it is for foundation depths or contaminant plume pathway mapping. Any time a construction change involves new concrete penetrations, there is the risk of hitting reinforcing steel, post-tensioned (PT) cables, or conduits that run through the slab. Geophysical methods can be used to mark these areas and avoid them. Whether you are performing environmental assessments, performing a renovation or constructing a new building, or exploring the suitability of a site to support new construction, geophysical testing might be a great way for you to save time, obtain better data, and reduce your costs.